It's that time of year again where the entire country stands up for a minute of silence followed by saying the national anthem in unison. I had posted about the death anniversary date of Ataturk previously - you may read it here. This year the event was a lot more different for me. 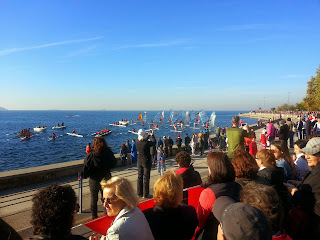 For the first time in my life, I witnessed what happens on that day in Istanbul. I felt feelings that I never knew I had and never knew could be felt. I woke up at around 7 am to say good bye to a friend who was going back to Athens. On my way back home, I saw so many people going down to the sea side. 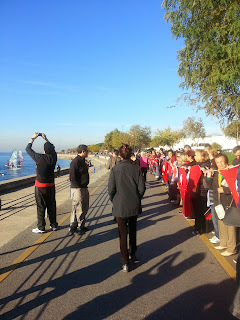 I realized they were going to the event as I noticed almost everyone wearing an Ataturk tshirt or holding a flag. I had a friend visiting me for the weekend so I quickly went up home and she was still sleeping. Without hesitating, I locked the door behind me and headed to the sea side. Thousands of citizens were lined up to create a chain longed at 6.5 km. I walked between the citizens and found myself a spot. Moments later, the siren went on, cars started honking, boats stopped moving, and everyone stood still, and all thoughts were with our Ataturk. Witnessing the country come together and being a part of it was just something out of this world. I tried to stay still as much as I could but I couldn't stop wiping tears from my cheeks. It got worse when everyone said the anthem. I got chills throughout my body and couldn't stop crying. It's been 75 years since we've lost Ataturk, and still, we stop and give a moment of silence for one man, a man who has made this country, who gave the country and its citizens a chance in this life. It just amazes me each time. I consider myself lucky to have the chance to be a part of this. I'm even more lucky to call Turkey my home.